1. Enlarging the pool of potential members (and other supporters). Begin with a preliminary step of gathering contact information for as many potential supporters as possible. Some may become members who pay annual dues, others will pay admission to attend events, and some will support a cause with money, time, or talent. The Dallas Museum of Art went so far as to give everyone who visited free admission and call them a Friends member (a separate “Partner” program exists starting at $100). Their approach has attracted lots of attention (including a $9 million gift to keep admission free and a big $450,000 grant from the Institute of Museum and Library Services to test their idea at other art museums) but otherwise it hasn’t been widely adopted and its impact is limited to increasing Friends memberships to 50,000 (that’s a big number, but what does it mean?). More revealing, perhaps, is that a few major art museums dropped admission fees at about the same time and reported both positive and negative impacts on membership. Calling everyone a member and collecting email addresses from visitors seems to be a harmless idea with potential benefits, although I haven’t seen any studies to show if these folks really consider themselves members and how well this converts people to more active supporters of any type . Perhaps the IMLS-funded project will provide some of this critical data. 2. Redefining the purpose of membership. We love membership programs although we often don’t know what they’re about. I recently helped form a new non-profit organization and one of the first things the group wanted to discuss was creating a membership program with fees and benefits–before we had defined our mission and vision. How could we attract supporters if we weren’t sure what we were about? Do we even need members? Co-production: to easily pool, access, share, and disseminate the tools, skills, experiences, and funds needed to fulfill the AASLH mission. Advocacy: to represent the interests of its members to elected officials, agencies, foundations, organizations, and other institutions at a state or national level. Notice that membership at AASLH implies a reciprocal relationship: in return for joining, members receive something of value. Too often, that exchange isn’t adequately evaluated and just copies what other organizations are doing: free admission, quarterly newsletter, store discount, or a totebag. Instead, identify the activities and programs your supporters most value and improve them as needed (or provide them if they’re not already offered). At AASLH, we’re focusing our attention on History News, annual meeting, and workshops, which a member survey identified as the most important benefits. Our goal is that every member benefit should try to provide participation, co-production, and advocacy in some way whenever possible. If a membership activity or program can only fulfill one of these goals, it may be something to stop doing. We’re trying to hit triples, not singles. Give today. Your generosity makes all the difference. The true benefit of your gift is the impact it has. Every dollar you give makes a real difference and helps accomplish the preservation, education, and public access/engagement that are the core of The Frank Lloyd Wright Foundation’s Mission. We understand the you don’t want us to spend your donation on gifts that we buy and send back to you. We know you give because you care–and we appreciate it deeply. That said, in addition to thanking you for your gift’s impact, we also want you to be part of what you make possible–and offer our gratitude by providing special access and engagement opportunities, only for donors. Every organization is different thus needs to develop its own distinctive membership program (or should we say philanthropy program?). Just like a good interpretation, you need to find where your mission and resources most strongly intersect with the interests and preferences of your target audience. The directions being followed by AAM, AASLH, or the Frank Lloyd Wright Foundation may not be right for you, but they could help you find ways to strength support for your museum or historic site. Whatever you do, make your decisions based on reliable information (e.g., surveys, interviews) and include transition and evaluation in your planning. Hayes, Debi and Alix Slater. “From ‘Social Club’ to ‘Integrated Membership Scheme’: Developing Membership Schemes Strategically.” International Journal of Nonprofit and Voluntary Sector Marketing 8, no. 1 (2003): 59-75. Holmes, Kirsten and Alix Slater. “Patterns of Voluntary Participation in Membership Associations: A Study of UK Heritage Supporter Groups.” Nonprofit and Voluntary Sector Quarterly 41 (2012): 850-869. Gruen, Thomas, John Summers, and Frank Acito. “Relationship Marking Activities, Commitment, and Membership Behaviors in Professional Associations.” Journal of Marketing 64, no. 3 (July 2000): 34-49. Paswan, Audesh and Lisa Troy. “Non-Profit Organization and Membership Motivation: An Exploration in the Museum Industry.” Journal of Marketing Theory and Practice 12 (Spring 2004): 1-15. Reavey, Brooke et al. “An Exploratory Study of Stalled Relationships Among Art Museum Members.” International Journal of Nonprofit and Voluntary Sector Marketing 18 (2013): 90-100. Slater, Alix. “Revisiting Membership Scheme Typologies in Museums and Galleries.” International Journal of Nonprofit and Voluntary Sector Marketing 9 (2004): 238-260. I’ve always thought of museums as having two types of memberships – what I call “functional” memberships, which give discounts, free admission, and other perks; and the “supporting” membership, which is what you describe for the FLW Foundation. One museum even separated the two in its membership brochure, stating that beginning at the $250 level (or whatever it was) your contributions start to go directly to supporting programs and the mission – implying that lower level memberships are really just quid pro quo arrangements. I also wanted to ask about this statement you made: “If the membership piece of the pyramid is getting smaller, that means the number of donors will fall as well.” Do we know for sure that’s the case? Thanks, Sandra! That’s a great way of looking at membership and it will help readers think about what kind of program they offer (and if that’s their intent). 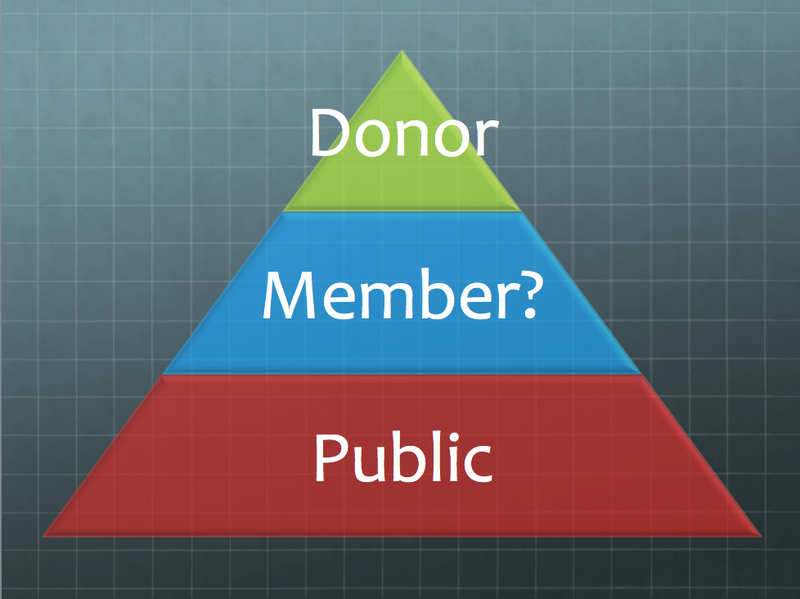 As for the donor piece of the pyramid getting smaller when membership declines, that’s the assumption I’ve heard from several museums and historic sites. It’s hard to imagine a decline in membership will cause an increase in donors, but what you are pointing out is that there’s very little research on understanding member and donor behavior over time to help us predict (i.e., if we have 500 members, what should we expect to see in the levels of giving? if 100 basic members joined this year, how many will become major donors in five years? how much does membership affect philanthropy?). I know development officers use a pyramid framework to calculate the potential success of a capital campaign, but I haven’t seen it applied to a membership program (i.e., if we have a membership program to support the organization, we need two $10,000 members, ten $2,500 members, 50 $250 members, and 300 $75 members). I’m collecting research studies on membership at museums and non-profits and I’ll share my findings in a future post.